Do any residents know where the tree mentioned on this plaque is? Does anyone know what happened to the oak tree? Forest Road -Road Closure .Click on the link for more details. I, Glen Chipp, being the Returning Officer for the Parish of PARISH OF COLGATE at an Election of Parish Councillors for the said Parish report that the latest time for delivery of notices of withdrawal of candidature, namely Wednesday 3 April 2019, having passed, the persons whose names appear in the accompanying list stood validly nominated and were duly elected without a contest. If you spot a problem on the highway be it a banner out of place or a pothole you can report it on the LOVE WEST SUSSEX.gov.uk site. SAVE FAYGATE STATION-are you interested in getting involved? Follow this link Save Faygate Station from closure..
New mapping tool for residents to use.Follow this link for more information Parish On line Mapping. Congratulations to AgeUK for successfully receiving £300 grant from Colgate PC. Congratulations to Friends of Buchan Park for succesfully bidding for £928 for gardening implements to improve and update the orchard at Buchan Park. Congratulations to St Catherines Hospice for being awarded £200 grant. Do you need a grant to help fund a project in the Parish? For more information check out the terms and conditions on the document tab above. The Colgate Parish is sited approximately half way between the major towns of Horsham and Crawley. 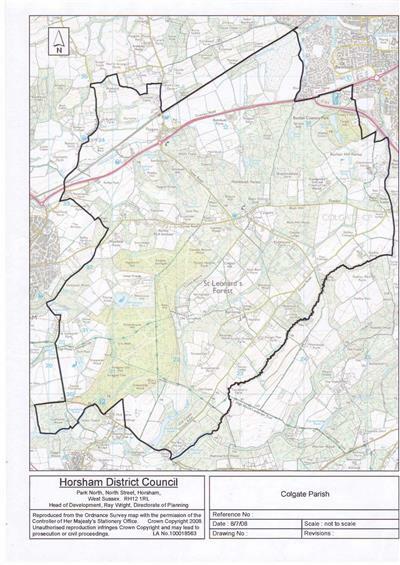 The Parish comes under Horsham District Council control. The Colgate part of the Parish is sited on the Southern side of the A264 and Faygate is on the Northern side. The Parish has approximately 1000 residents, this will increase when the Kilnwood Vale and Durrants Village developments are completed. Colgate Parish Council comment on planning applications and discuss local issues and act upon concerns of the community such as speeding and highway issues.The Parish Council do not make decisions on education. Meetings of the Parish Council are held on the second Monday monthly each year (except August or December), alternating between Colgate School and Faygate Village Hall/Durrants Village for venues. Please see the meeting tab for more information. Residents are welcome to attend any of these meetings and have the opportunity to raise issues during the agenda point when the public are allowed to raise issues.It is only during this time that the meeting is open for public comment. Once the public have raised an issue the public forum time is closed and members of the public are no longer able to speak during the meeting.Members of the public can ask for agenda items to be added to the agenda via the Clerk or the Chair. There is also a Annual Parish Meeting (review of the year) held in March and a Annual Council Meeting (election of the Chair) held in May. Planning meetings are held on an as required basis, please refer to Notice Boards for details. The noticeboards are located in Blackhouse Road,Colgate by the village hall, in Faygate Lane by the mini roundabout and in the park in Kilnwood Vale by the metal arch. There are three pubs, a railway station and a school located within the Parish as well as Buchan Park which belongs to West Sussex County Council. St Saviour’s Church can be located on Forest Road in Colgate.